Makar Sankranti is Our Forth coming Festival. In almost every Bengali kitchen will be full with aroma of Date Plam Jaggery Or "Nolen Gur". This fastival is known as "Poush Sankranti" in West Bengal. Varities of sweets are made with Ground rice, date plam jaggery , milk and many other ingredinets. Puli Pithe is a Bengali sweet dumplings stuffed with sweet coconut & date pulm jaggery filling and boiled in whole milk. Without this sweet Poush Parbon is incomplete. Puli Pithe is a Bengali sweet dumplings stuffed with sweet coconut & date pulm jaggery filling and boiled in whole milk. First take a pan and mix all the ingredients under the heading of "Filling". Turn on the heat and place the pan on medium heat and stir constantly to prevent burning at the bottom. At first coconut will release lots of water, slowly eveporate the water and make a soft but not watery mixture by stirring constantly. Turn off the heat and let the mixture cool down. Take another non-stick pan boil 1 cup of water. Add 1 teaspoon Ghee and a little salt in the boiling water and stir. Reduce the flame, add the rice flour while stirring continuously. Whisk well so that no lumps remain. Cover with a lid and keep aside for about 20 minutes. Grease your palms with a little oil and knead the dough while it is still warm; if the dough cools it will get lumpy, if it is not kneaded. You could even use a hand blender to knead the dough. But I will recommend to kneed it with your hands. Now make small balls from the dough. Flatten the dough ball on the palm of your hands or with your fingers. Now make small round balls from the Dough, make a small hole inside of a ball by pressing your oiled thumb, put 1 tablespoon of stuffing inside the hole, bring the two edges together and press the edges to close and secure the shape of half moon. Place the Dumplings aside covering with a dump cloth to protect them forming skins on the body. Now take a pan, add little water into it and add the milk into the pan. Turn on the heat and place the pan on heat. Bring the milk to a nice boil. Let the milk boil till it thickens, but stir constantly to prevent the milk burn from the bottom. When the milk reduced to half of its quantity, add the rice and the Dumplings/Pulis to the milk, simmer the milk and let the dumplings and rice to cook. It will take 15-20 minutes to cook the dumplings and the rice. Remember to stir the boiling milk in every 2 minutes, but very carefully. Otherwise the Dumplings could be broken. After 15-20 minutes take one dumpling on a plate and try to cut it with a spoon. If it has cut easily, then the puli is cooked. If not , then you have to boil for another 5 -10 minutes. If the dumplings are cooked, take 3-4 tablespoons of the boiled milk in a separate bowl, add little amount off the jaggery. If the milk has not curdeled, the jaggery is good to be added. If the milk has curdled then the jaggery is not good. If the jaggery test goes clear , add the jaggery, sugar & crashed cardamom pods to the boiled milk and stir to mix and again boil the milk for 5 minutes. After 5 minutes turn of the heat and let the payesh cool down. 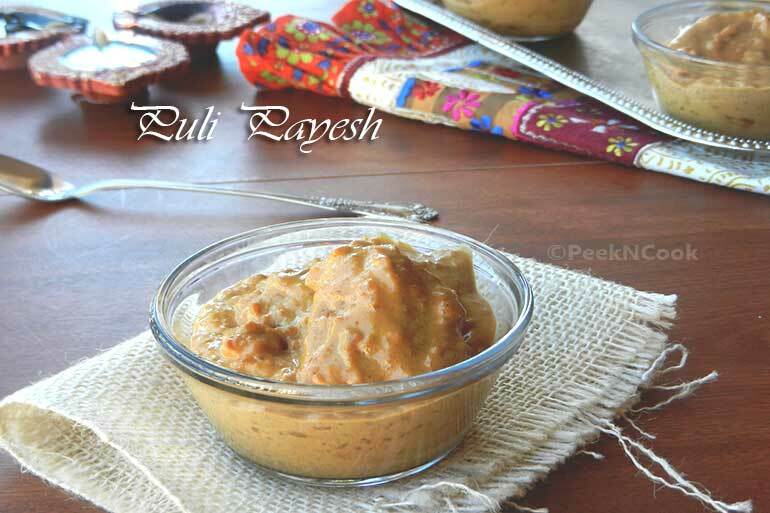 Serve Puli Payesh warm. It tastes best when it is warm. If the jaggery test went wrong, then add enough sugar to make your Payesh sweet and the rest is same.